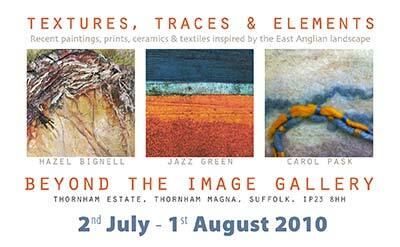 ‘beyond the image’ gallery is in a converted ‘listed’ barn on the thornham estate. a very long flint wall in the gallery hosts new exhibitions each month, the central part of the gallery (with white partitioned walls) shows a changing display of contemporary photography. 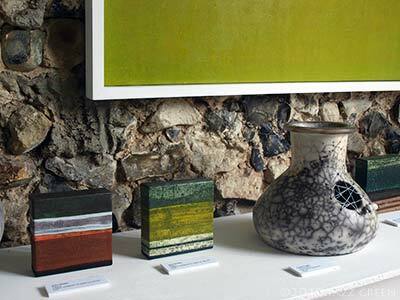 Textures, Traces & Elements is a contemporary art exhibition of mixed media paintings, collagraph prints, ceramics & textiles by three Suffolk-based artists: Hazel Bignell, Jazz Green and Carol Pask. 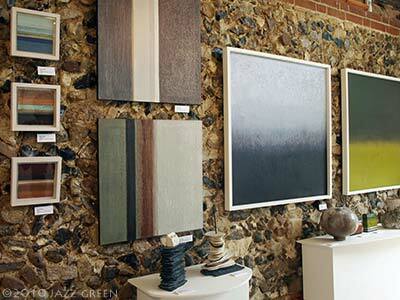 These three artists respond boldly and uniquely in both process and media to the East Anglian landscape. 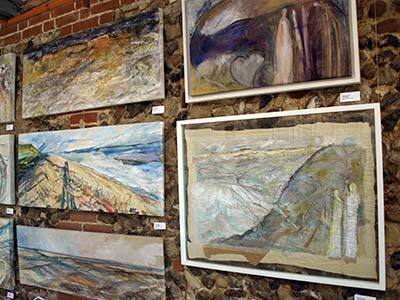 Hazel Bignell uses collage, painting and mixed media on canvas. Inspired by time spent at the coast, her quietly symbolic and textural artworks reveal hidden narratives found in the patterned strata of unusual pebbles, eroded cliffs, the ebb and flow of the water’s edge and evening shadows. 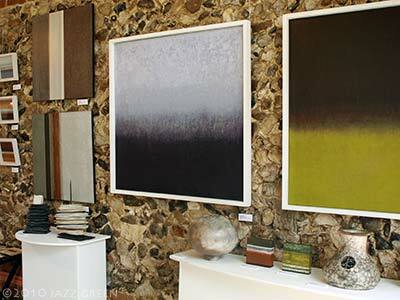 Jazz Green focuses on the overlooked details of the rural landscape, the ephemeral traces of weathering and decay on neglected outbuildings, the myriad colours and textures of rust, mould and lichen, which are subtly distilled into contemplative, zen-like, minimalist abstract works on canvas and paper. Carol Pask is a ceramicist, known for making vessels with delicate, smoke-fired glazes or the raw earthiness of the raku process, which naturally complement her more recent sculptural and textile pieces. 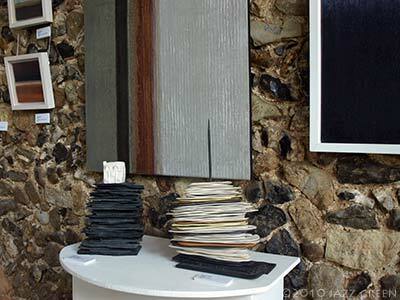 Her work is also inspired by the environment, with an emphasis on organic structures and naturally-derived colours. When seen together, the work of these three Suffolk artists present an engaging and contemporary perspective on the influence of the East Anglian landscape. 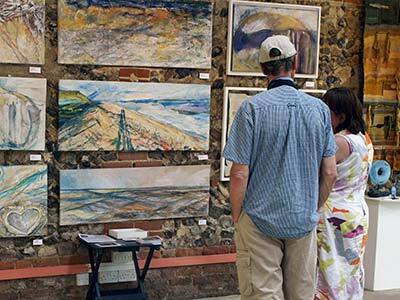 Beyond the Image Gallery is a contemporary, artist-run exhibition space located within the beautiful setting of the Thornham Estate, conveniently situated just off the A140, midway between Ipswich and Norwich. The Thornham Estate also includes twelve miles of waymarked footpaths through naturalised meadow and woodland, known as the Thornham Walks. Together with designated picnic areas, a traditional walled garden, an information centre and a cafe, this makes a visit to the Thornham Estate a very enjoyable and relaxing day out for all the family. on: Sunday 4 July 2010 by jazzgreen. 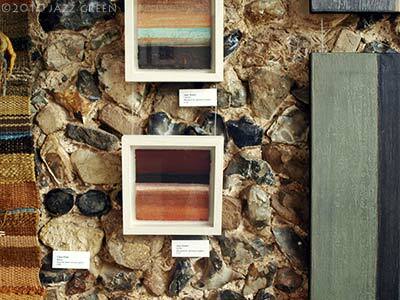 Your work looks really well against that busy wall, Jazz – the individual works seem to provide a suitable focus to slow things down & there’s also a pleasing correspondence between your colours & those of the stones & cement. Here’s hoping you all enjoy some success from the exhibition. What a wonderful space. Your work looks great against those walls.